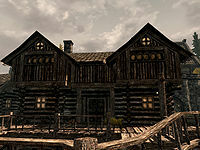 Haelga's Bunkhouse is a boarding house in Riften run by Haelga that houses several of Riften's citizens. It is the first building on the right when entering via the main gate to the north. Upon entering you are faced with the L-shaped counter with a door behind. On the counter is a copy of Horker Attacks, a note from one of Haelga's suitors, four loose septims and an iron dagger underneath. To the right above the counter on the west wall is a bottle of Nord mead, a bottle of wine and a couple of sacks. On your right when you enter, against the east wall is a dresser. To the west is the dining area with two long wooden tables with benches and one small square table with two chairs. On the tables are four salmon steaks, two seared slaughterfish, a boiled creme treat, a garlic bulb, a raw rabbit leg, a sweet roll, a baked potato, a portion of grilled leeks, a bottle of alto wine, two bottle of wine and several loaves of bread and cheese. In the southwest corner is a cooking pot on a stand next to a food barrel. To the east of the counter is a large open area with chairs and barrels in the northwestern corner, under the stairs that lead up to the bedrooms above. Against the east wall is a square wooden table and two chairs with a bottle of wine on the table, a wooden bench and a cupboard holding a potion of minor healing, a potion of minor stamina, a bunch of lavender and a ruined book. At the southern end of the room is a door that leads to the staircase down to the cellar with a dresser to the right of it against the wall, on this is a statue of Dibella, a bunch of lavender and two wooden bowl containing two of each red, blue and purple mountain flowers. Behind the counter, the door leads to Haelga's bedroom, which contains a double bed (complete with shackles) coming out from the middle of the west wall, with an end table to the left which holds The Lusty Argonian Maid, v1 and v2, a red apple, a bottle of Nord mead and if you have completed the initial Thieves Guild quest also a bottle of Falmer Blood Elixir. At the foot of the bed is a dresser with a Shrine of Dibella, a honey pot--(see notes), a bunch of lavender, a leather strip and a bowl containing a red, blue and purple mountain flower. To the right and under the bed are additional leather strips as well as a horker tusk. On the wall to the right of the bed is a chair and on the north wall is a wall shelf holding an apprentice locked strongbox and two potions of minor stamina, a potion of enhanced stamina and a potion of vigor, which are obviously for use by her suitors as she spreads the love of Dibella in her unique way, which you will quickly learn by listening to Haelga and her niece Svana. Further to the right, still against the north wall is a wardrobe containing clothes and in the northeast corner is a small square wooden table, with a bottle of Nord mead and the business ledger on top. There are several food barrels by the top of the staircase down to the cellar and on one of these are three loose cabbages. Descending the stairs brings you to the first of two rooms linked by a doorway both used for storage. The first contains more barrels some containing foodstuffs, others containing ingredients, a pile of firewood including four loose pieces and several bales of straw. The second room in the cellar contains various pieces of disused furniture, more barrels and sacks, three sets of shelves and a cupboard. The cupboard only holds clutter, but the shelves hold three bottles of Nord mead, two bottles of wine, two cabbages, ten potatoes, two loaves of bread and many pieces of cheese. At the top of the stairs leading up to the second floor, there is an alcove in front containing a few barrels of food. There are two doorways from here; one to the west and the other to the east. Both rooms are very similar as both room have five single beds, four end tables, a fireplace with a piece of firewood beside it and a door to the south. The room to the west has a wardrobe in an alcove to the north and on the end tables are three bottles of wine and a bottle of Nord mead. The door to the south opens into a storeroom with several barrels and crates. The room to the east has a dresser with a bottle of alto wine and a copy of the Pickpocket skill book Beggar on top, in the alcove to the north and on the end tables are a bottle of Nord mead, a bottle of wine and a salmon steak, with a second bottle of Nord mead on the mantelpiece and a wall shelf on the east wall with a couple of sacks and another bottle of Nord mead. The door to the south open into Svana Far-Shield's bedroom which consists of an owned single bed in the northeast corner, with an end table beside it, a wall shelf above, holding a bottle of wine and a wardrobe containing clothes against the south wall. Despite Haelga's claims that the bunkhouse is "not some sort of a luxury inn for tourists", the beds are free to sleep in. Although Svana has her own room, she seems to sometimes sleep in one of the dormitories with the others. The honey pot is one of only two to be found in the base game. When doing The Numbers Job for the Thieves Guild, there is a 50% chance that the quest marker for the Haelga's Bunkhouse Ledger is pointing to a crate instead of the ledger. See the quest page for details. This page was last modified on 28 April 2018, at 10:03.